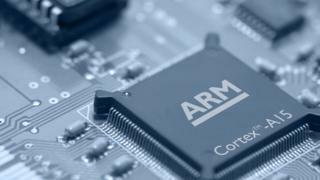 ARM Holdings, one of the UK's biggest technology companies, is set to announce it is being bought by Japan's Softbank for £24bn ($32bn). The board of ARM is expected to recommend shareholders accept the offer - close to a 50% premium on its closing market value of £16.8bn on Friday. The Cambridge-based firm is arguably the most precious jewel in the crown of British technology. Its microchip designs are in an array of devices including Apple's iPhone. Sources close to the deal say the Japanese company considered ARM well placed to exploit the "internet of things" - the embedding of microchips in whole new categories of household and business devices. The proposed takeover of ARM poses a dilemma for the new government. Along with high executive pay, Prime Minister Theresa May has put foreign takeovers on her radar of business dealings that may be bad for the national interest. However, the government will be keen to show that the recent Brexit vote has not deterred foreign investment. The BBC understands that Softbank will commit to doubling the size of ARM's UK workforce over the next five years. Barring government intervention, the final decision will be made by shareholders. ARM, which was founded in 1990, employs more than 3,000 people. Much of its success came under Warren East, who was chief executive of ARM from 2001 until 2013. He was made CBE in the 2014 New Year Honours list for services to engineering and technology. Mr East became chief executive of Rolls-Royce, the engineering giant that makes aircraft engines, in July last year. Sir John Buchanan, then ARM chairman, said in 2013 that Mr East had "transformed" the firm during his time as chief executive. Softbank is one of the world's biggest technology companies and is run by its founder, Japanese entrepreneur Masayoshi Son. It has previously acquired Vodafone's Japanese operations and the US telecoms company Sprint. The $20bn deal was the biggest foreign acquisition by a Japanese firm at the time. Shares in Softbank have fallen 15% in the past 12 months.